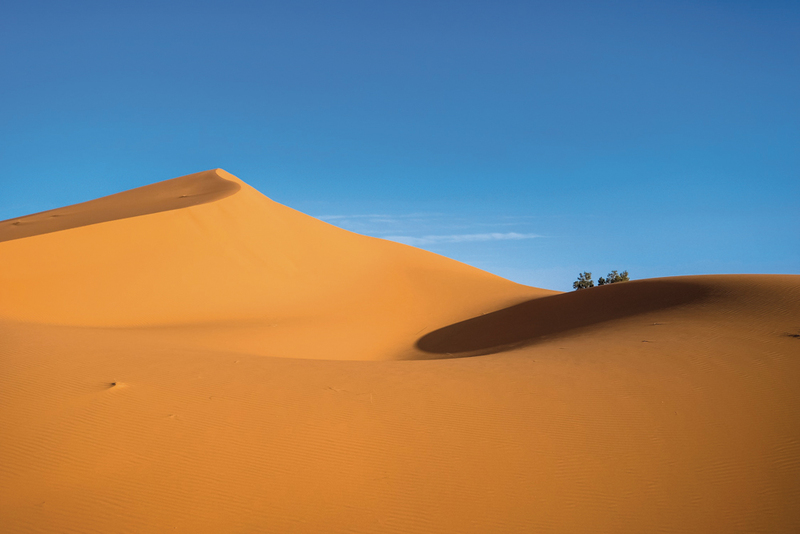 The Sahara Desert, an expanse comparable in size to the U.S., is one of the hottest and most arid regions of the planet. Up until the 1990s, global warming seemed to be causing more frequent and severe Sahara droughts. But in the last three decades, a surprising transformation has been occurring: increased rainfall, more plant growth, and an overall greening of the desert. Eleven thousand years ago, the Sahara was green and alive, pocked with lakes, rivers, grasslands, and even forests. Scientists think that over time, humans and their goats tipped the balance, turning the area into an immense desert. With temperatures rising everywhere, how is it that the Sahara, unfriendly to plants, is re-vegetating? Warmer ocean temperatures are leading to increased evaporation off the Atlantic coast of Africa. This moisture is carried inland by high-altitude winds, causing increased precipitation. As more plants grow, evaporation from their leaves increases precipitation even more. Moreover, plants stabilize the sands, furthering an anti-wind-erosion tendency and reducing the number of sand-dust storms and their desiccating effect. Another counterintuitive effect is that rising carbon levels in the atmosphere provide a kind of aerial fertilization that increases plant growth while utilizing water more efficiently. The more carbon dioxide there is in the air, the more plants grow. The result is plant growth in areas that were recently inhospitable to their growth. There is scientific uncertainty about some of these phenomena; the only certainty is that rainfall and vegetation have increased during the past three decades. Not all agree that this trend will continue, but geological records indicate that the greening of the Sahara can happen rapidly, up to 10 percent per decade. As far back as 1980, discussion began about creating a Great Green Wall across the southern Sahara, not literally a wall, but a 10-mile-wide, 4,000-mile-long, tree-planted strip to deter desert expansion. By 2005, this forestry initiative had morphed into a comprehensive social, economic, and environmental program to reverse land degradation, desertification, and drought. The goal is to provide food security for 20 million people, create 350,000 jobs, and sequester 250 million tons of carbon by 2030. Already, large swaths of the desert are being reclaimed. To get local engagement, tree ownership needed changing from the government to individuals. This provided incentive to apply the traditional wisdom of digging “half-moon” pits to store water for trees. More than 200 million trees have been planted and restored. In Niger, one of the poorest countries, farmers have greened vast tracks of arid land. Now, lands all around the Sahara are being reclaimed and re-vegetated, food production is increasing, and carbon is being drawn down. Greening the Sahara will not reverse climate change, but it will help slow it.